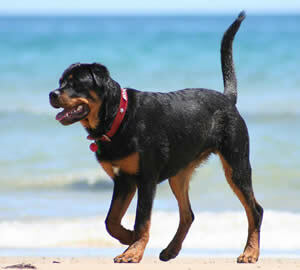 The Rottweiler Dog names list is filled with names suitable for this stout, confident and imposing dog breed. Many of the names are related to combat, war and leadership. Names like Sargent, Gunner and Tank populate the list. The Rottie, as they are often known, is a popular guard dog and often leads to tough or macho names like Bear, Duke and Hulk. Have you heard a Rottweiler names Powder Puff, Pinky or FiFi? In the famous dog names category, the following Rottweiler dog names come to mind. Indo and Zhaki are Will Smith’s Rottweilers and Baby is a Rottie belonging to Leonardo DiCaprio. OK, Baby may not be so bad as Pinky, but pretty darned close! Something to remember when naming your Rottweiler Dog is to match your dog’s personality, purpose and stature with their name. This is one tough dog and you might want a tough name to match. To learn more about this working dog breed, visit our Rottweiler Dog breed information page. Learn about the Rottweiler Dog temperament, trainability, and even a little of the breed’s history before deciding on this or another dog breed. Below is a list of my favorite 101 Rottweiler Dog names. If you don’t find a name you like after browsing the list, return to our Dog Names by Breed page to see more categories. You can also expand your search to our list of more than 4,000 puppy names. Angus Outstanding and exceptional man. Arrow A straight, thin, pointed shaft shot from a bow. Ava From Avis – A bird. Famous Name: Ava Allan is a TV actress and a model born on March 1, 2000, in Los Angeles California. She had her first modelling career for Disney catalog when she was 6 years old. She was involve in several commercials for some companies like Hyundai, Hasbro, and Nissan. .
Avalanche A fall or slide of a large mass, as of snow or rock, down a mountainside. Bear Large mammal with large head, bulky body and coarse thick fur. Very suited to the Rottweiler dog names list and the Rottie breed. Blaze A brilliant burst of fire. Cassandra Enticer of men – for the female pet who is hard to resist. Cougar A large powerful American mountain cat. Famous Name: Hannah Dakota Fanning (born 23 February 1994) is an American actress who launched onto the movie scene with an amazing performance I Am Sam, the 2001 film starring Sean Penn and Michelle Pfeiffer. At 19 (in 2013) she already has 49 TV and Film credits to her name, including appearances in the Twilight movie series. Diamond An extremely hard colourless gemstone. Also for diamond shaped marking. Duke Highest ranking nobleman – Leader. This is one of my favorite Rottweiler dog names. Famous Name: Ebony Vernice Hoffman is an American professional basketball player from Los Angeles, California. She was born on August 27, 1982. Ebony plays for Connecticut Sun in the WNBA. She currently plays for Besiktas Istanbul in Turkey. Greta Equivalent of Margaret – A pearl. Grizzly A species of brown bear. Also appropriate among Rottweiler dog names due to the size and stature of this powerful dog. Hannibal Either Hannibal the general who famously carried elephants across the Alps or the Hannibal the cannibal from the ’90s movie. Take your pick. Indo Among famous Rottweiler dog names. Indo is the name of Will Smith’s Rottie. Mr. Smith has another Rottie names Zhaki. Jake From Jacob – To fill the place of another. Famous Name: Jake Beckley or born as Jacob Peter Beckley was a Major League Baseball player. He was born on August 4, 1867, in in Hannibal, Missouri. He elected into the Baseball Hall of Fame in 1971 because of his 2,930 hits during his 20-year career. Kingston Kings farm or royal manor. Kodiak Large Alaskan brown bear. There’s that bear resemblance again. Lincoln From the colony by the pool. Famous Name: Abraham Lincoln was the 16th president of the United States. He was the son of Thomas and Nancy Hanks Lincoln. Together with Hannibal Hamlin as his running mate, Lincoln won the election and declared as 16th president on November 6, 1860 in which he defeated Douglas, John Bell, and John C. Breckinridge. Famous Name: Maxwell George “Max” Schneider is an American singer-songwriter, dancer, actor, model, and musician. At the age of 3, he already began acting and he hasn’t stopped since. Together with Ben Charles, they wrote “Show You How To Do” for the Disney hit show Shake It Up. Mercedes Compassionate, merciful and Reward in Latin. Midnight Intense darkness, the middle of the night. Missy Informal term for young woman. Moose Largest member of the deer family. Moose have heavy brown bodies with humped shoulders and broad antlers. Muscles Tissues that enables bodily movement. To be forceful – muscled into the conversation. Nevada Latin origin, meaning snow. Olga I like this for female Rottweiler dog names because of its German roots. Panzer German armored fighting vehicles of World War II. Raptor A bird of prey, like an eagle, falcon, hawk, etc. Famous Name: Laura Jeanne Reese Witherspoon, popularly known as Reese Witherspoon, is an American actress and producer. She was born on March 22, 1976 in New Orleans, Louisiana. She already began modelling when she was 7 years old. She had her first major acting role in Robert Mulligan’s The Man in the Moon (1991). Sage Aromatic grayish-green herb. Wise or experienced person. Samson From Sampson – Sun’s man. Great name. Famous Name: Samson Satele (born on November 29, 1984) is an American football center from Kailua, Hawaii who is currently playing for the Miami Dolphins. On August 2, 2014, he signed a contract with the Miami Dolphins. He was released by his former team, the Indianapolis Colts, on March 6, 2014. Satele graduated from University of Hawaii. Sarge Noncommissioned Army or Air Force rank. Sky The expanse of air over the Earth. Terminator Love this for guard dogs. Thunder Sound produced from lightning. Tyson Son of the German. Famous Name:Michael Gerard “Mike” Tyson (born on June 30, 1966) is a 48-year old American retired professional boxer from Brooklyn, New York City. He served jail time and he also appeared in several films such as The Hangover. He has a documetary film about his life titled, Tyson ..
Zhaki Another on the famous Rottweiler dog names list, Zhaki is a second Rottie owned by actor, Will Smith. His other Rottie is Indo. Can’t find the name you like on the Rottweiler Dog names list? Don’t give up. Return to our Dog Names by Breed page to do some more exploring. If you have a great name, tell us about it! Prada was the name of my first Bullmastiff. I’m a fashionable person so i named her after this designer. Famous from ‘a streetcar named desire’. Stella is my Rotties name. When she get’s into something I say loudly STELLA!!! We named our puppy Rocky but my Little nephew couldn’t pronounce it and said lucky. That’s the perfect puppy name full of love.